Researchers have found evidence that acupuncture could help people who experience dental anxiety. Dental anxiety affects up to an estimated 30% of the adult population in countries world-wide. Patients can experience nausea, difficulty breathing and dizziness at the thought of going to the dentist, during an examination, and following treatment. Reasons behind dental anxiety can be various, such as fear of pain, needles or anaesthetic side effects, as well as embarrassment or feeling a loss of control. In a review of six trials with 800 patients, researchers used a points scale to measure anxiety and studies show that anxiety reduced by eight points when dental patients were given acupuncture as a treatment. This level of reduction is considered to be clinically relevant, which means that acupuncture could be a possibility for tackling dental anxiety. Previous clinical trials have involved acupuncture for treatment on a range of conditions, including lower back pain, depression, and irritable bowel syndrome. There is, however, limited research detailing its impact on specific cases of anxiety. More than 120 trials across England, China, Spain, Portugal and Germany were identified as having investigated the effects of acupuncture on patients with dental anxiety, and six trials were eligible for review, with two demonstrating high quality methods. Professor of Acupuncture, Hugh MacPherson, at the University of York's Department of Health Sciences, said: "There is increasing scientific interest in the effectiveness of acupuncture either as a standalone treatment or as an accompanying treatment to more traditional medications. "We have recently shown, for example, that acupuncture treatment can boost the effectiveness of standard medical care in chronic pain and depression. "Chronic pain is often a symptom of a long-term condition, so to further our understanding of the various uses of acupuncture we wanted to see what it could achieve for conditions that occur suddenly, rapidly and as a reaction to particular experiences." Studies that compared anxiety levels between patients that received acupuncture and those that did not, showed a significant difference in anxiety scores during dental treatment. A clinically relevant reduction in anxiety was found when acupuncture was compared with not receiving acupuncture. 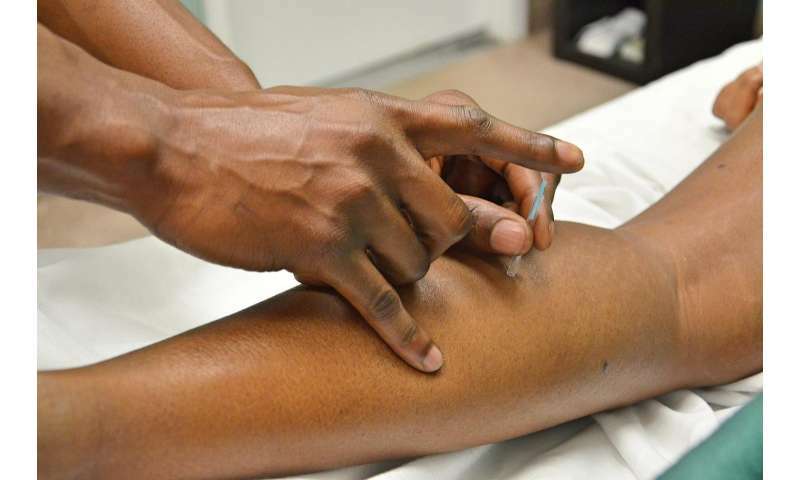 No conclusions could be drawn, however, between patients that received acupuncture as an intervention and those that received placebo treatment, suggesting that larger scale controlled trials are needed to increase the robustness of the findings. Professor MacPherson said: "These are interesting findings, but we need more trials that measure the impact of acupuncture on anxiety before going to the dentist, during treatment and after treatment. "If acupuncture is to be integrated into dental practices, or for use in other cases of extreme anxiety, then there needs to be more high quality research that demonstrates that it can have a lasting impact on the patient. Early indications look positive, but there is still more work to be done." The research is published in the European Journal of Integrative Medicine.